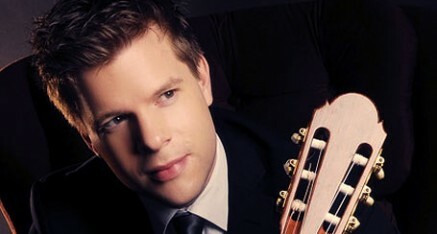 London-based guitarist Adam Brown has performed throughout Europe, the United States and South America. Among his many concert appearances are recitals at Lincoln Center’s Alice Tully Hall and the 92nd St.Y-Tisch Center for the Performing Arts in New York City, and at London’s Wigmore Hall and Southbank Centre. He has also performed at such renowned music festivals as Aspen (USA), Spoleto (Italy), Accademia Chigiana (Italy), Amsterdam International Guitar Festival (The Netherlands), Bath International Guitar Festival (England) and the Musica y Danza Festival (Peru). Performances in the 2011/2012 season included solo recitals at the Purcell Room at London’s Southbank Centre, the Bath, Bermuda, Bolivar Hall-London Guitar Festival, and Cheltenham International Guitar Festivals, the Edinburgh International Fringe Festival and the International Guitar Festival at Kings Place in London. The Rebels Within, Adam Brown’s first commercial solo album, released in 2009 features works by Benjamin Britten, Frank Martin, Nuccio D’Angelo and Lennox Berkeley. Gladios, his recently released second album, showcases works by prominent Latin American composers, including Lauro, Montes, Chavez, Piazzolla, Brouwer and Barrios. Adam’s most recent recording, Without Limits-An American Century of Music for Guitar, will be released in 2013. This exciting album will highlight the eclectic characteristics of contemporary music in the United States. Born in Edinburgh, Adam Brown studied with Carlos Bonell as a Foundation Scholar at the Royal College of Music in London, where he earned his Bachelor of Music degree with Honours and received several prestigious awards. He continued his studies with Sharon Isbin at the Juilliard School in New York City, completing the Masters of Music degree and subsequently becoming the first guitarist to obtain Julliard’s distinguished Artist Diploma degree. He went on to earn a performance-based Doctorate in Musical Arts at the University of Southern California in Los Angeles, where he studied with the celebrated guitarists William Kanengiser and Pepe Romero.